Since her appointment in 2011, she has been at the forefront of developing and strategically positioning Ireland’s dynamic design and craft sector as a key component of the Irish economy. In 2015, Karen led Irish Design 2015, the year-long government-backed initiative which saw Irish design and designers being celebrated and promoted in Ireland and around the world in order to drive job creation, grow exports and increase competitiveness. Currently she is the Chairman of Showcase Ireland Events Limited and a Director of Kilkenny and Carlow Education and Training Board. Karen is a member of the National Design Forum and the Advisory Group for Small Business. 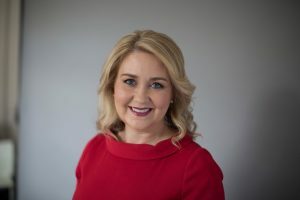 She also sits on a number of advisory committees such as the Industry Advisory Committee of UCD’s Cantillon Centre for Entrepreneurship, Innovation and Design. Karen is a qualified Chartered Accountant and holds an MBA from UCD Smurfit School.